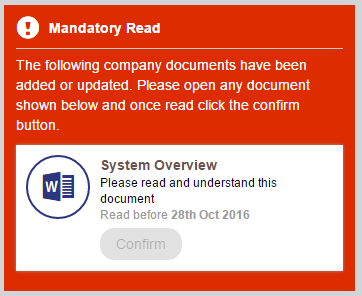 The SharePoint Mandatory Read Module allows administrators to assign specific documents to a group of users, forcing the users to read them and confirm that they have done so. When a task is created, a SharePoint Mandatory Read Web Part will appear on the Intranet Home Page. This will be hidden when there are no tasks available for the user.A user must first click on the link to the document. This will open the document in a new tab for it to be read. Once the document link has been clicked, the “Confirm” button will change from inactive to active.A user must click on the “Confirm” button and accept the on-screen prompt to close the task. The task will then be removed from the list – if this is the last remaining task then the Web Part will then hide itself again.Each time a user presses “Confirm”, a new item will be added to the Mandatory read Acknowledgement List for reporting purposes. Each Mandatory Read Task has a “Status” that is automatically defaulted to “Active”, meaning that the Task will appear for all defined users who are yet to complete it.If the “Status” is set to either “Completed” or “Cancelled” then the task will not appear. It is recommended to manually set tasks to “Completed” once all users have performed their Read Activity. This will just safeguard the speed of your Intranet Page where the Mandatory Read Web Part is placed.Please make use of the packaged reporting to identify when a task has been confirmed as read by all participants.If a new employee joins the organisation and is added to a group that has been used for a Mandatory Read Task, then you can set the “Status” of that task back to “Active” this will then enable that to appear for all new staff members who did not have the chance to Read and Confirm previously. previous post: 60 Second Briefing – What is Delve?